On their daily outings, naturalists hike with the sharpest of senses. Eyes peeled and ears open, they help spot the cloud forest’s hidden treasures, sharing its flora and fauna with students and guests. For days, weeks, and on some occasions even months, UGA Costa Rica is home to students studying abroad and majoring in you-name-it. Sure, in the forests surrounding our campus there are a plethora of silent slitherers, winged creatures, and four-legged forest dwellers, but today I’d like to highlight student diversity. Although eager to share our knowledge of Costa Rica’s biodiversity, we’re equally thrilled to see students using their array of talents to capture the wonders of this cloud forest. The diversity of passion pouring from these budding artists, writers, doctors, ecologists, etc. is seemingly endless. Kind of like the night sky in this incredible video made by Jacob Denbrock, a Belmont film major. He’s just one example of the students inspired by this environment. Enjoy! Just the other week, a few UGA Costa Rica interns spotted monkeys while hiking the trails around campus. Seeing a white-faced capuchin monkey is reason enough to do a happy dance, but after getting a closer look, the naturalists realized they were in the presence of spider monkeys – an incredible rarity to spot on campus. So much so, that no member of the UGA Costa Rica staff can recall ever having seen the orange-tinted primates on campus trails. The Central American Spider Monkey is among the most active and agile of cebids, (family Cebidae) or New World monkeys. Part of the reason for their activeness is body morphology; their forelimbs and fingers are longer than other monkeys’, and they have a vestigial, or underdeveloped, thumb – it just gets in the way of swinging! Having a prehensile tail sure does help with agility, too. It’s like having a fifth arm. A spider monkey’s prehensile tail is not only defter than other monkey tails, but it also has exposed skin on the underside, like a no-slip grip with which it confidently grasps branches. Spider monkey diets mainly consist of fruit. Because of the sugars in fruit, they are high-energy, moving quickly and frequently in the canopy in order to find more of their sporadic source of food. To make up for the lack of protein in the fruits, spider monkeys may eat young leaves and decaying bark. So why all the rave about spotting spider monkeys at UGA Costa Rica? The more commonly seen white-faced capuchin monkeys, recognized for their aggressive and territorial behaviors, may have been quite defensive of their UGA Costa Rica territory in the past, thus keeping spider monkeys at bay. The first theory then, is that perhaps the dynamic between monkey groups has recently been changing and the two species are learning to overlap territories? Another hypothesis is that the monkeys are following their food source. With changing climate, there’s a chance fruit dispersal patterns are deviating from the norm, and spider monkeys are adapting locations as a result. Over lunch, I chatted about a third, and seemingly promising theory with Jheudy Carballo, a tour guide leading the Morganton Day School throughout Costa Rica. Having worked as a guide for the past 16 years, Carballo raised his eyebrows when I mentioned the spider-monkey sighting. First, he mentioned that he has seen spider, howler, and white-faced capuchins all in one tree, and therefore doesn’t think the sighting is a result of territorial cease-fire. According to Carballo spider monkeys were supposedly wiped out of the Monteverde region by yellow fever in the 1970s. Their population has since been bouncing back, and it’s possible that they are now expanding their territory from the Monteverde Reserve area into the UGA Costa Rican cloud forest in order to maximize on food availability. He also mentioned that a growing population is indicative of a rejuvenating forest. Bienvenidos to the spider monkeys! It’s difficult to tell whether the fog is coming from the mountain mist or from somewhere underneath my heavy eyelids. It’s approximately 6:00 am and I’m standing in dew-dabbled grass, gazing through misty binoculars, a toothy grin stamped upon my face. The first bird of the day has just been spotted. UGA Costa Rica Monthly Bird Count day has arrived! Each month, in addition to scheduled morning bird watching with guests, naturalists and bird watchers alike devote an entire day to exploring the campus canopy for birds… and exercising their neck muscles. The group of bird watchers gathers around the scope to get a good look at a spotting. There are two main reasons for the nine-year-old tradition. The first: spending a day with folks familiar with the birds of Costa Rica – colors, calls and all — is great training. 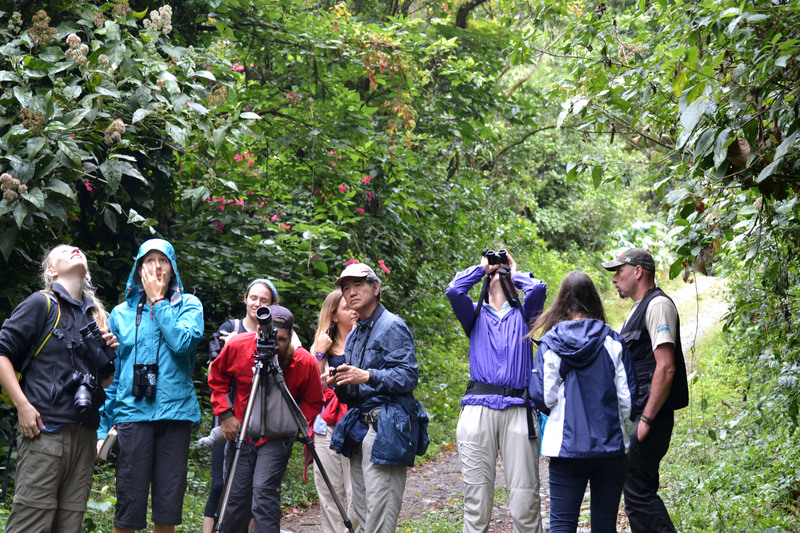 The monthly birding tours are usually led by a Monteverde native or veteran tourists – all knowledgeable bird watching enthusiasts, nonetheless – and is, as a result, a learning experience for UGA Costa Rica resident naturalists, who are persistently practicing bird identification. The second reason for the monthly bird count is to maintain a long-term data set of bird species flocking to and around the San Luis, Monteverde region. These monthly snapshots could be used to study trends, patterns, and anomalies regarding both cloud forest dwelling and migratory birds. For instance, in 2006, when the count was inaugurated, the melodious blackbird, Dives dives, was occasionally spotted in the San Luis cemetery. Now, it’s among the top ten most commonly seen birds around campus. How does it work? 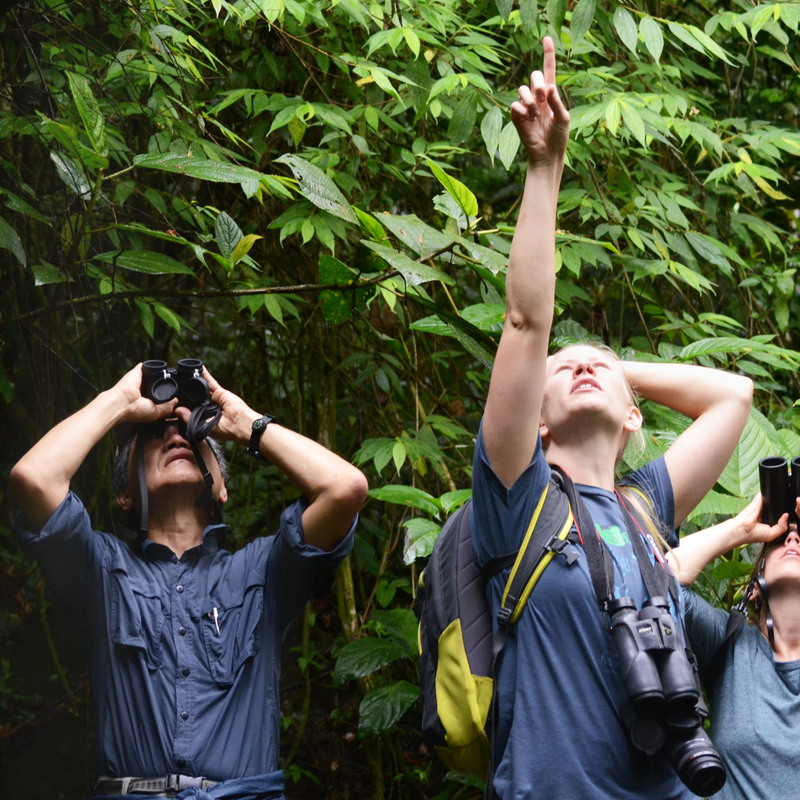 Birdwatchers wander and hike the trails surrounding UGA Costa Rica’s campus identifying every bird with which they cross paths. A designated note-taker jots down what others have spotted and proceeds to tally any additional finds of the same species. And to maximize their efficiency, of course the crew brings the essentials: binoculars, spotting scopes, and bird books. Resident naturalist Regan Fink peers through binoculars, her handy accessory for the day. 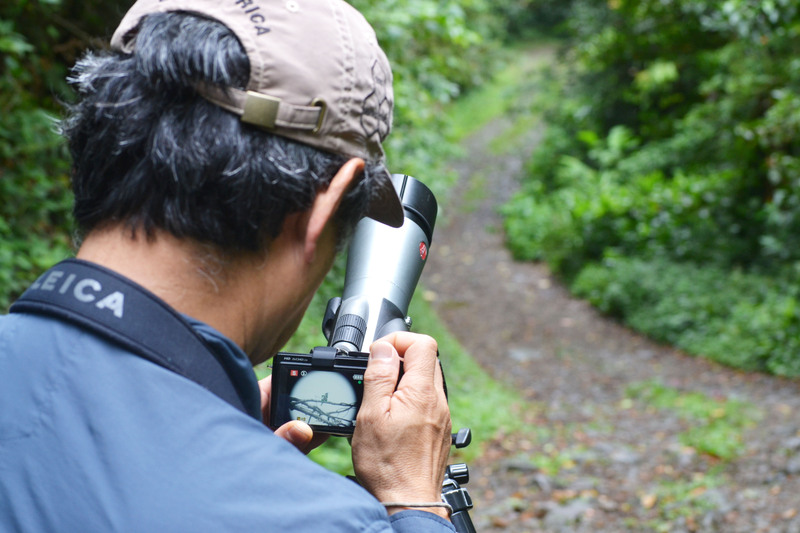 Russ Kumai focuses his scope on a spotted bird. 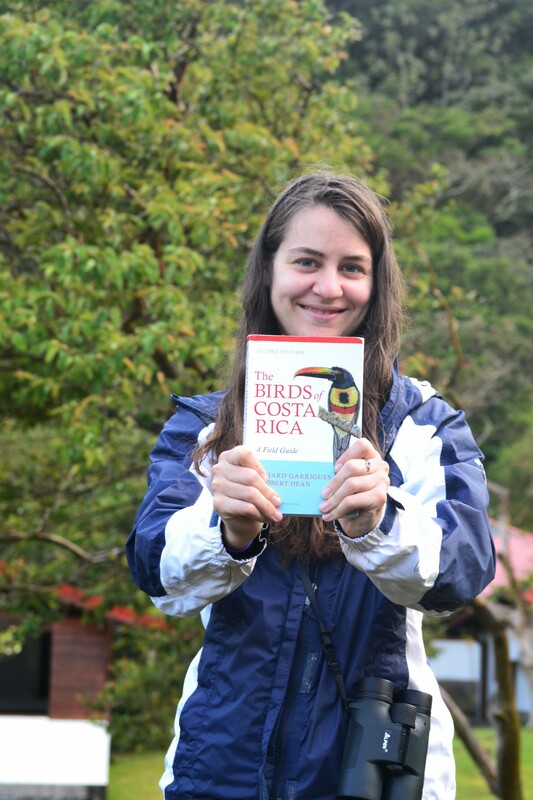 Resident naturalist Jessica Murray holds the Birds of Costa Rica book, a helpful reference for bird count day! Resident naturalist Louise Beveridge relishes the bonding that comes with the group birding activity. Naturalists spend much of their days leading tours and scheduling with guests individually; therefore, spending time doing one activity together is rare. Resident naturalist Louise Beveridge smiles after locating a perched bird. Becoming a birding fanatic doesn’t necessarily happen overnight. 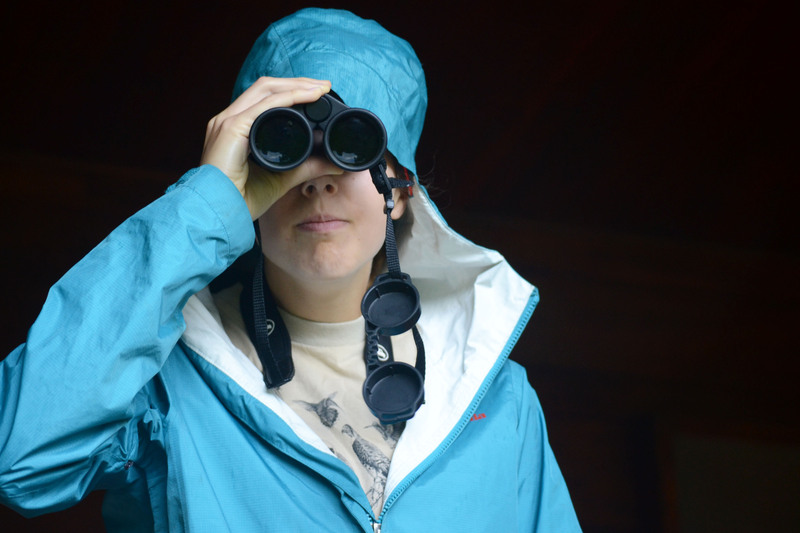 Beveridge wasn’t the biggest fan of birding when she first came to intern at UGA Costa Rica. “I didn’t like birding when I got here, I found it overwhelming. There are over 800 species of birds in Costa Rica. Where do you start?” Beveridge says. But after spending some time entering the tedious bird count data, she not only grew familiar with certain species, descriptions, and calls but also grew to love it. Eventually, enjoyment swept over her initial anxiety. Nowadays she’s up before breakfast each morning, meandering throughout campus with eyes glued upwards. Let’s take a peek at some of the birds that she, along with other naturalists, identified during the Thursday, April 23rd Bird Count. The bird which racked up the highest amount of sightings was the national bird of Costa Rica: the clay-colored robin! Twenty-nine of this species, Turdus grayi, were counted around campus. The bird has typical robin behavior, hopping around the ground, and can be distinguished from other Costa Rican robins by its yellow-green bill. The clay-colored robin is common throughout the majority of the country, and is recognized by its persistent whistles from the months of March to June. Arguably the rarest find of the day was the magenta-throated woodstar. Calliphlox bryantae. This male hummingbird has a longer tail than most, with white patches on both sides of his rear and a characteristic magenta-colored throat. Although magenta-throated woodstars typically feed on low-growing flowers, they often perch high in the canopy on leafless twigs, exactly where this little guy was spotted. 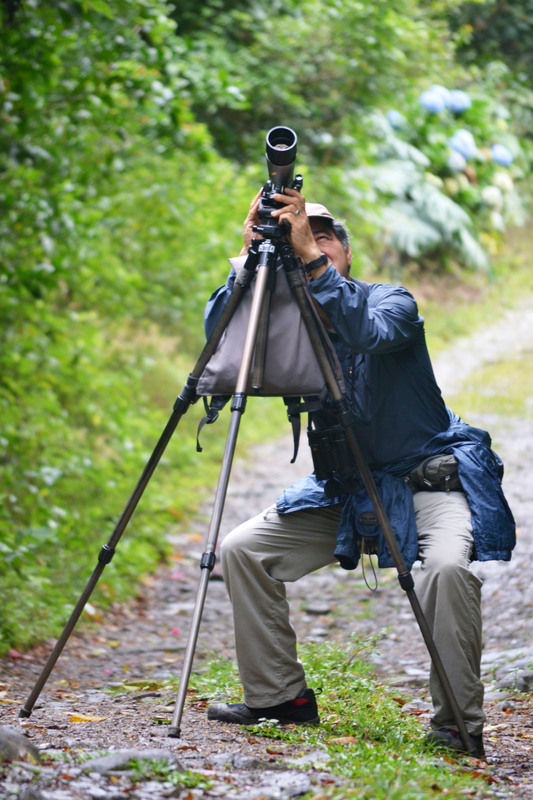 Russ Kumai snaps a picture of the magenta-throated woodstar. Another great find was the montezuma oropendola, Psarocolius montezuma. Although most commonly distinguished either by its call or bright-yellow tail, its defining characteristics are colorful facial markings and a two-toned bill. A fun fact about this species is that it is a colonial breeder. 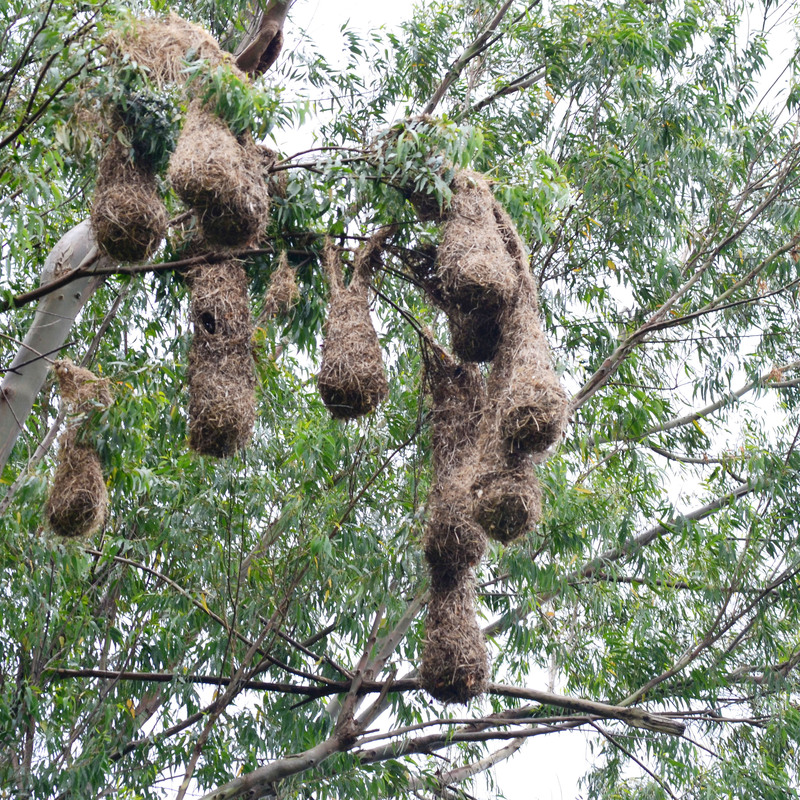 A dominant male mates with most of the females within a colony, which consists of an average of 30 teardrop-shaped dangling nests, built from vines and twigs – quite the sight to see! The montezuma oropendola perches next to its tear-drop-shaped nests. 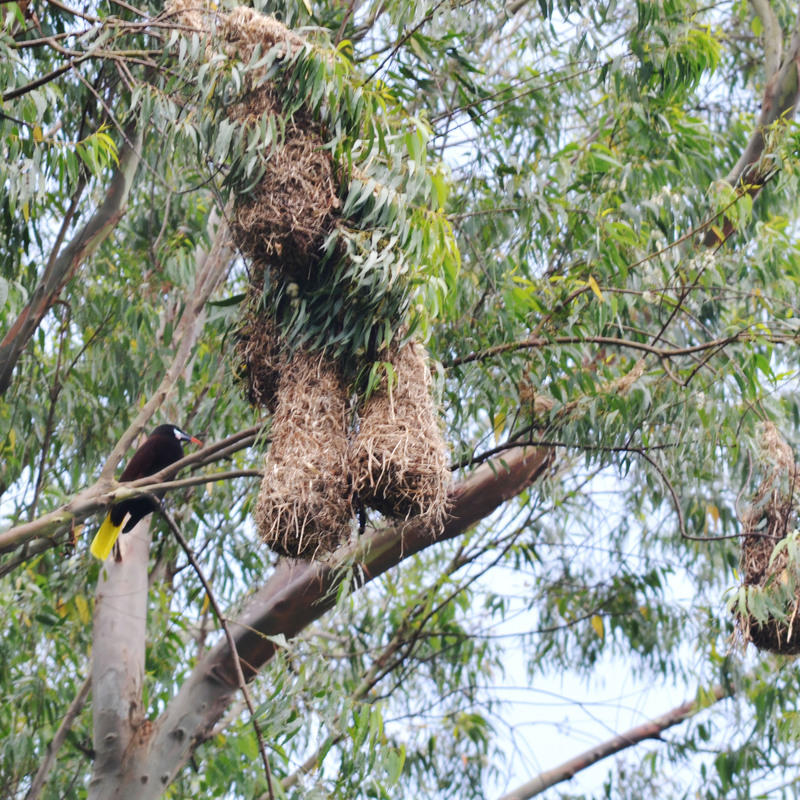 Montezuma oropendolas live in colonies in these vine-constructed nests. Check our more photos from the April Bird Count on our Facebook page! Each day a symphony of bird songs, monkey calls, and pattering rain is carried through campus by the whispering wind. Rustling bushes, likely a coati or agouti crunching its way along the decomposing forest floor, add to the orchestra of sounds. Occasionally, however, something much bigger may be lurking behind the swaying green curtains surrounding you. Oh, yikes, sorry for the goose bumps – I’m just taking about resident naturalists preparing for one of our campus activities! Resident naturalist Hannah Durick explains the ABCs of plant identification. UGA Costa Rica offers a Plant-O-Rama: a hands-on workshop in plant identification for students, tourists, plant masters, and newcomers alike. Naturalists spend mornings or afternoons hunkered down in the cloud forest collecting leaf samples for this crash course in cloud forest plants. You may raise an eyebrow when they emerge from a dense sea of Heliconia leaves with a garbage bag. But taking a peek inside reveals a kaleidoscope of green and yellow; the forest’s smooth, rough, straight, jagged, citrusy and smelly plants morph into a visual and olfactory puzzle. Students listen as a naturalist launches into the Plant-O-Rama. Guests take notes or simply absorb the clarity of the information flowing their way. The main objective of the activity is not only to teach guests the basics (and not so basics) of identifying plants and plant families, but also for them to practice and engrain their newfound knowledge. The guests’ first hands-on task is to disassemble the bouquet of forest sitting before them, defining and dividing the plant samples as either monocotyledon or dicotyledon, which are the two divisions of flowering plants. A monocot, at the time of germination has one leaf sprout, and a dicot has two. As the plants grow, they develop specific characteristics that keep them identifiable as one or the other. A monocot typically has an elongated leaf with a sheathing central stem, and veins that run parallel to each other throughout the leaf. A dicot’s leaves are attached to either a stem or branch by a stalk and the veins are web-like. Students consult with Hannah, resident naturalist, about whether or not to sort a leaf as monocot or dicot. 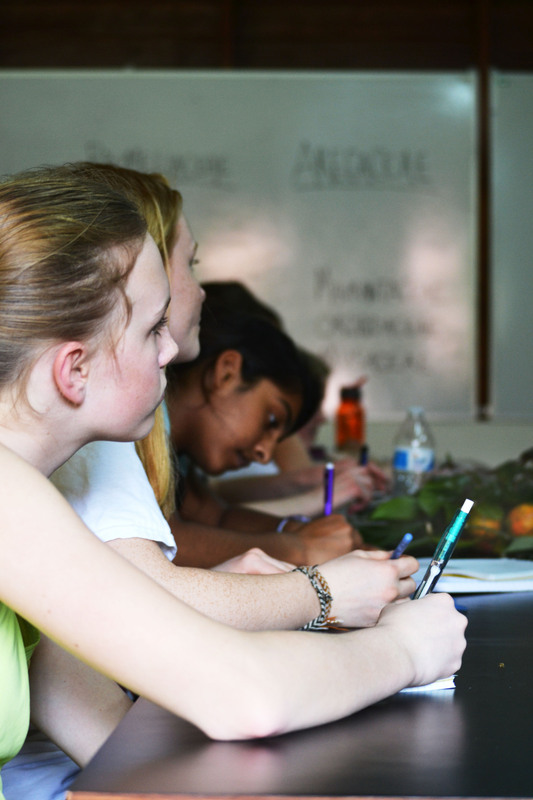 Hannah, resident naturalist, helps students identify key characteristics in a dicot plant. Monocot family names are listed on the board to help students and guests organize their leaf samples. The Plant-O-Rama uses more than just one of the five senses! This student sniffs a leaf, curious if the scent will help identify the sample. Students reference their notes while sorting leaf samples. Once sorted, the next round of musical plants involves grouping plants according to family. Naturalists name and describe characteristics of plant families while guests look, touch and smell their green subjects. Bamboo palm leaf waits to be sorted. This bamboo palm waits to be sorted. Looking closely, you can see bright parallel veins stretching vertically on each leaf. It’s also not woody, so (check the hints above..) you know it’s a monocot. The plant has compound leaves, and with a striking resemblance to a palm, this bamboo palm falls into the Aracaceae, palm, family. Students hold the leaf up to the light, looking first at the web-like veins, and then for lighter spots or oil glands, typical in plants in the Rutaceae family. Having categorized these leaves as dicots because of their network of veins, these high school students attempt to identify the family. Members of the Rutaceae, citrus, family often have thorny stems (ouch!) and oil glands, which appear as lighter spots in the leaves. Members of this family also have a citrusy smell if the leaves are crushed. Well done, ladies! Out of toothpaste? Need to go to the pharmacy? Craving ice cream? Time to head into Santa Elena, a town about a 20 minute ride from our campus that takes you through the rising mountains and beautiful vistas of Monteverde.